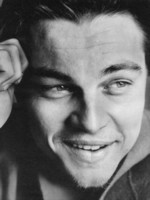 Leonardo's performance skills became obvious to his parents early on, and after signing him up with a talent agent who wanted Leonardo to perform under the stage name "Lenny Williams", DiCaprio began appearing on a number of television commercials and educational programs.DiCaprio began attracting the attention of producers, who cast him in small roles in a number of television series, such as Roseanne (1988) and The New Lassie (1989), but it wasn't until 1991 that DiCaprio made his film debut in Critters 3 (1991), a low-budget horror movie. 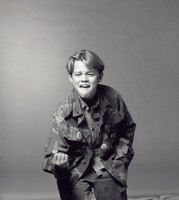 While Critters 3 (1991) did little to help showcase DiCaprio's acting abilities, it did help him develop his show-reel, and attract the attention of the people behind the hit sitcom Growing Pains (1985), in which Leonardo was cast in the "Cousin Oliver" role of a young homeless boy who moves in with the Seavers. 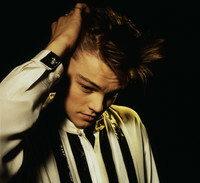 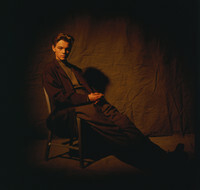 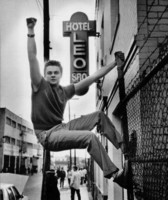 While DiCaprio's stint on Growing Pains (1985) was very short, as the sitcom was axed the year after he joined, it helped bring DiCaprio into the public's attention and, after the sitcom ended, DiCaprio began auditioning for roles in which he would get the chance to prove his acting chops.Leonardo took up a diverse range of roles in the early 1990s, including a mentally challenged youth in What's Eating Gilbert Grape (1993), a young gunslinger in The Quick and the Dead (1995) and a drug addict in one of his most challenging roles to date, Jim Carroll in The Basketball Diaries (1995), a role which the late River Phoenix originally expressed interest in. 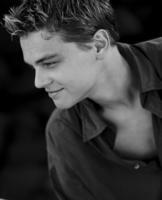 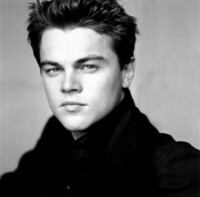 While these diverse roles helped establish Leonardo's reputation as an actor, it wasn't until his role as Romeo Montague in Baz Luhrmann's Romeo + Juliet (1996) that Leonardo became a household name, a true movie star. 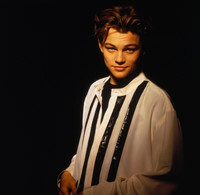 The following year, DiCaprio starred in another movie about doomed lovers, Titanic (1997), which went on to beat all box office records held before then, as, at the time, Titanic (1997) became the highest grossing movie of all time, and cemented DiCaprio's reputation as a teen heartthrob. 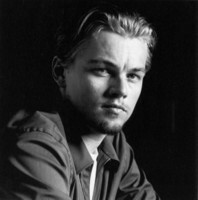 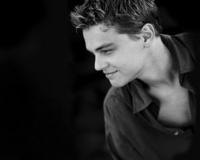 Following his work on Titanic (1997), DiCaprio kept a low profile for a number of years, with roles in The Man in the Iron Mask (1998) and the low-budget The Beach (2000) being some of his few notable roles during this period.In 2002, he burst back into screens throughout the world with leading roles in Catch Me If You Can (2002) and Gangs of New York (2002), his first of many collaborations with director Martin Scorsese. 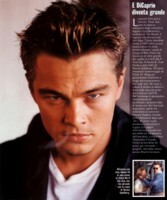 With a current salary of $20 million a movie, DiCaprio is now one of the biggest movie stars in the world. 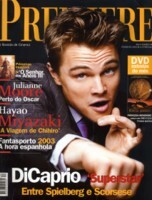 However, he has not limited his professional career to just acting in movies, as DiCaprio is a committed environmentalist, who is actively involved in many environmental causes, and his commitment to this issue led to his involvement in The 11th Hour, a documentary movie about the state of the natural environment. 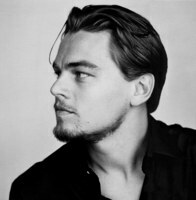 As someone who has gone from small roles in television commercials to one of the most respected actors in the world, DiCaprio has had one of the most diverse careers in cinema. 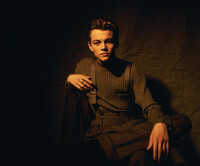 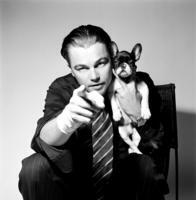 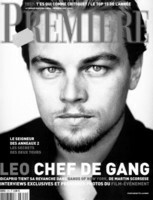 DiCaprio continued to defy conventions about the types of roles he would accept, and with his career now seeing him leading all-star casts in action thrillers such as The Departed (2006), Shutter Island (2010) and Christopher Nolan's Inception (2010), DiCaprio continues to wow audiences by refusing to conform to any cliché about actors.In 2012, he played a mustache-twirling villain in Django Unchained (2012), and then tragic literary character Jay Gatsby in Великий Гетсбi (2013) and Jordan Belfort in The Wolf of Wall Street (2013).DiCaprio is passionate about environmental and humanitarian causes, having donated $1,000,000 to earthquake relief efforts in 2010, the same year he contributed $1,000,000 to the Wildlife Conservation Society.